2 Bedroom+Loft/2 Bath Wonderful Cabin in Big Bear! 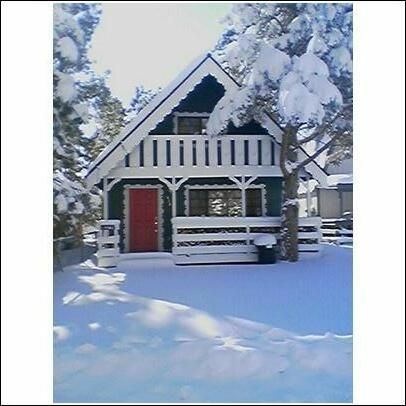 Welcome to our wonderful cabin in the quiet community of Big Bear City! Our cabin is recent new construction of a classic Big Bear chalet cabin! We NOW have 1,250 sq feet of space for your family to come up and enjoy, when we are not able to! In July 2010 we finished the new en-suite master bath and master suite! We are very excited about this addition to our cabin with a new back deck! This is our second home so we have added many things that the typical 'rental' would not have. WE HAVE CENTRAL HEAT! which most cabins don't have. It's great in the winter! We find that our cabin is relaxing, and feels just like home. In fact, we have a hard time leaving our cabin, and so will you! We have provided a warm and comfortable place to relax and enjoy the beauty of Big Bear. Our alpine chalet has 2 bedrooms + a loft, and now, 2 baths! The downstairs master suite with en-suite bath, has a beautiful custom travertine shower, and a granite double-sink custom vanity. Our upstairs bedroom also has a custom Kentucky Queen log bed. Both of our log beds are equipped with Tempur-Pedic mattresses. The loft has a twin bed and a double futon. All the beds have nice rustic bedding, comforters, and sheets. We feel that using nice bedding makes staying away from home just that more special. The counter tops are tumbled marble tile, and the cabinets are custom red oak. The kitchen table has seating for 4. Out the slider door from the kitchen is our backyard with a custom built deck with a nice b-bque with seating and a picnic table, which provides a great place to relax, especially in the summertime when it's gorgeous outside! The living room is really comfortable with a leather sofa and an over sized chair to sit and enjoy the fireplace or the 37 inch flat screen TV, complete with BluRay DVD player (bring your BluRays). We also have a DVD library so feel free to enjoy a movie. Of course we have wireless internet! Our pool table will provide hours of fun after the long day hiking or skiing (it is not regulation size but is still a lot of fun)! We are 10 minutes (around 7 miles) from Bear Mountain and Snow Summit, so enjoy the quiet and relax while still being close enough to enjoy it all! 5 Minutes from the tubing center in Big Bear City. During the summer, there is hiking, biking, and lake activities to enjoy. This is a year-round area so anytime of year is nice. Please enjoy your stay in our quiet cabin! Please note: We do NOT rent to ANYONE under 30 years old and proof of age is required! We will charge for extra messy guests who don't follow the checkout policies. That's what the extra $140 cleaning charge is for. If you are clean and leave our cabin just as you found it, you will get a refund. Problem past guests have ruined it for good guests but we need to protect our property so it stays nice for everyone! 2 night minimum all year! PLEASE NOTE: I KEEP THE CALENDAR UP TO DATE, CHECK YOUR DATES ON OUR CALENDAR BEFORE YOU SEND US AN E-MAIL! Thanks, your hosts and owners, John, Lisa, and Heather! Hello there! Heather, Lisa and John (Heather and I are in the picture!) welcome you to our cabin in Big Bear! We just wanted you to know a little more about us. John and I are musicians and own our cabin with our my sister Heather, who lives in TX. We bought our cabin in June 2008, but started looking in February during a really big snow storm! As busy musicians John and I really felt like we needed a getaway for our family in the mountains. Heather and I are skiers and love going to Snow Summit! During March of the 2010 ski-season we both learned how to snowboard, very brave of us.! I think I am still sore! We all love hiking the trails up here and look forward to more wonderful times, winter or summer! We thought the location of our cabin was ideal in a quiet area but close enough to skiing and hiking but away from the party life of Big Bear central. It was perfect for us. There are alot of properties around but our cabin is simply put, NEW and one of a kind! We offer all the amenities of a 5 star resort but at a bargain price. You won't find many cabins like ours, especially with all the neat touches that we feel make it just like home, or even better! This is a peaceful residential neighborhood, so for those who like peace and quiet, this is it! Portable AC for the loft area available in summertime! Our cabin comes with new bed sheets (that match), comforters and down blankets for the winter. In winter the 2 Queen beds have warm electric heated mattress pads to make it even more cozy! We also provide soft, designer towels for your use. Our pillows, except for ones on the twin and futon, are designer. Kenmore stacked washer and dryer. Very quiet units, and they wash and dry remarkably quick! Great for washing for the next hiking or skiing day. Downstairs Vizio 37 inch flat screen with Cable. DVD player for movies. Downstairs bedroom also has a flat screen TV. The loft Flat screen LCD is also connected to a DVD player, perfect for the kids or to just relax and watch a movie. DVD's provided for your enjoyment. You can also bring your own. Loved the cabin the owners thought of everything!!! Best part was the beds with large heating pads. We would love to revisit once again when in town. Thank you Mona! We try to keep everyone warm and comfortable! Please let us know when you’d like to visit again you are welcome anytime! What a wonderful stay!!! The cabin was like new and completely modern inside and provided everything we needed. The beds were super comfortable too!! It was a short drive to the trails and village and Lisa was wonderful to deal with and extremely responsive. I highly recommend and would book again in a heartbeat. We love guests like you guys! Please come back soon. It was our pleasure to have you stay at our cabin!!! My wife and our two boys stayed the weekend at this Cabin. One of the main reasons we chose this home was due to the A/C in the summertime. The first floor ended up reminding cool throughout our visit, but we did need to utilize the mobile unit upstairs, and it kept two rooms pretty cool. Our family really enjoyed the pool table, and the kids played every chance they got. Kitchen was setup nicely and we used it for every meal. Backyard was convenient as we used it for star gazing since our telescope was on-hand. We had some minor issues like towels and an empty propane tank which could have given this review a four, but Lisa and her team were all over getting things corrected immediately. Overall we had a good time and would definitely rent again. We love having great families like you guys rent from us! I take pride in our cabin and if any issues arise I do take care of them asap. Please come back anytime Henderson clan! Thank you! Was a perfect place to stay. Clean and easy to get to any ski resort, restaurant and stores. We walked in and it was clean and perfect for us. We plan to definitely stay at this house again. Owner quick to respond and easy to get info from. Highly recommend!!! Thanks for your wonderful review which we really appreciate! Great guests are always welcomed back! We loved this little cabin! We found it to be very pleasant, warm, cozy, and quiet. All the comforts of home, plus a pool table! The beds are very comfortable, everything is nicely maintained. We'll be back! We love perfect guests like you guys who leave our cabin in the condition it deserves! Thanks again for being great guests and please come back any time! My wife and I had such an amazing time at the Alpine Chalet! It was our little weekend get away and it was well worth the stay! Lisa was very accommodating and was informative with her instructions and directions. She responds fast to her e-mails so if you have any issues at all don't hesitate to email her. Our driveway was freshly plowed after the big storm and I couldn't thank her enough for doing that because our neighbor who rented the cabin next door had to manually shovel 2 feet of snow out driveway themselves! (Thanks again!) The house was clean and well kept, the heater worked perfectly. Ill definitely be back considering the price of her cabin and the location! Thanks Lisa! OUR RATES INCLUDE TAXES AND CLEANING FEE! AN ADDITIONAL CLEANING DEPOSIT OF $140.00 IS ALSO REQUIRED AND SOME OR ALL OF IT IS REFUNDABLE IF OUR CABIN IS LEFT IN SAME CONDITION AS CHECKIN AND CHECKOUT RULES ARE FOLLOWED. WE'VE HAD SOME PROBLEMS WITH PAST GUESTS WHO HAVE NO REGARD FOR OUR PROPERTY, SORRY.